Walk 80 Miles for Mary this May! It's Spring (finally!) which makes it a wonderful time to go outside and take a nice, long walk - many of them. Denise Johnson-Bossert, author of Gifts of the Visitation: Nine Spiritual Encounters with Mary and Elizabeth , has come up with a great idea to put some added purpose behind that spring exercise. She has started "Walking with Mary this May" - (https://www.facebook.com/events/784292698353727/) - "We're going to walk or run 80 miles this May--the distance from Nazareth to Ein Kerem. [This is the route Mary took to visit Elizabeth] You can do it anywhere ... outside, on a treadmill, in your country of choice. Just get moving, and take Mary with you." So, put on your walking shoes and join us in this fun and prayerful venture! To mark the 150th anniversary of the American Civil War’s end, the Knights of Columbus Museum presents Answering the Call, an exhibition profiling various military and civilian support figures during the four-year conflict (1861-1865). Answering the Call focuses on religious ministry and medical care provided to Civil War soldiers. It also includes a history of the 9th Connecticut, a volunteer infantry regiment whose members were predominantly of Irish ancestry, many of whom were from New Haven. The first supreme knight of the Knights of Columbus, James T. Mullen, was a sergeant in the 9th Connecticut. The show centers on wartime struggles and hardships as well as acts of bravery, charity and compassion in the midst of battle. Catholic soldiers and officers — Confederate and Union — are profiled, together with battlefield chaplains and religious sisters who nursed the wounded in hospitals and prisons. Answering the Call also includes references to battles and military campaigns, with emphasis on conditions in military encampments and the aftermath of combat, such as medical care and the spiritual needs of the wounded and dying. This project has been about a and a half in the making. The idea first came to me in October 2013. I was losing my job at Catholic Lane and and trying to figure out what I was going to do next. The idea for this site came to me in the shower (where many good ideas percolate) and I set to work. I to create a site where someone could find information on the different styles of homeschooling as well as search for curriculum and find support and encouragement no matter where she was in the homeschooling journey. The project took a back seat to other projects that came my way, but I would keep working on it from time to time. It was definitely one of my goals for 2015 to get it ready for public viewing. That day came today! Since becoming Pope on March 13, 2013, Pope Francis has taken the world and the Church by storm. He took Francis as his name and "his optimism, courage, and playful sense of humor are reminiscent of the beloved saint." In "The Spirit of St. Francis: Inspiring Words from Pope Francis," editor Alicia Von Stamwitz has collected a quotable collection of Pope Francis' teachings. Cognizant that the Pope's words have occasionally been taken out of context, Von Stamwitz emphasizes that these quotations "have been selected and arranged with care. They are taken directly from the official Vatican texts of Pope Francis's homilies, speeches, tweets, audiences, prayers, daily meditations, and writings." The quotations are organized into themes: the love of God, God's forgiveness, God's mercy, prayer, joy, humility, the poor, preaching the Gospel, promoting peace and pardon, and protecting creation. This book is not meant to be read cover to cover, but rather to be opened to a certain section to read a quote or two, and then to reflect upon that quote. It would be a perfect book to have on a nightstand to assist with morning or evening prayer. Like St. Francis, Pope Francis offers so much food for thought in both his words and his deeds. 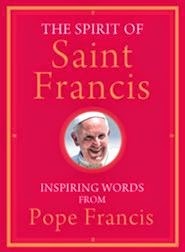 "The Spirit of Saint Francis" is a wonderful compilation of his most memorable quotes to date. Designed for use in a traditional classroom, these lessons were easily adaptable to a homeschool environment. Topics covered include: matter, changes of state, density, periodic table & bonding, water molecule and dissolving, and chemical changes. This was an incredibly hands-on program which the boys really enjoyed. A few supplies are necessary to buy or borrow, but overall the cost was small for such a quality program. The handful of times I didn't have the materials at my disposal, we simply read through the lessons and watched the accompanying videos. A test bank of questions is also provided so that one can create tests for each chapter with ease. I highly recommend this program for anyone searching for a chemistry program designed for middle-schoolers. I recently read Shakespeare Saved My Life: Ten Years in Solitary with the Bard by Dr. Laura Bates. She tells of her experience teaching Shakespeare in a Maximum Security Prison in Indiana and of one student in particular, Larry Newton, who has been in prison since he was seventeen and will die in prison. "Why should we do good for bad people?" The answer is because 'anything else would be bad.' If we are not doing good for bad people, then we are doing bad for bad people. We should not be working on ways to do bad for isolated populations of people; rather we should work on developing good no matter who is on the receiving end. That is our obligation to society. . .
We cannot risk not helping. The vast majority of prisoners are going to return home. They are going to be our neighbors and they are going to be around our loved ones. The question really comes down to: what kind of prisoner do you want living next to you? No matter how you feel about the subject, the reality is that these prisoners are indeed coming home, and you do have the power to help shape what kind of neighbor they will be. Why education? Because it is the one science that overwhelmingly works. Are you thinking about homeschooling? Or are you a seasoned homeschooler who is often asked for information about homeschooling? 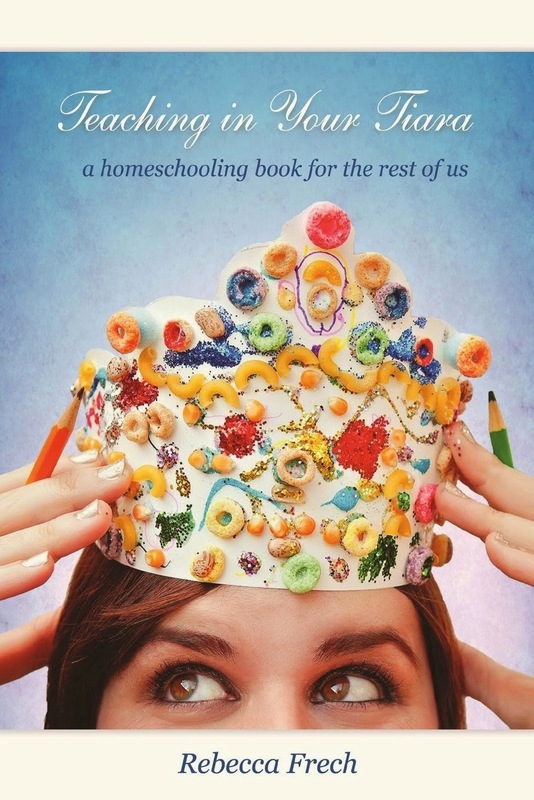 "Teaching in Your Tiara: A Homeschooling Book for the Rest of Us" is a great "intro to homeschooling" book. 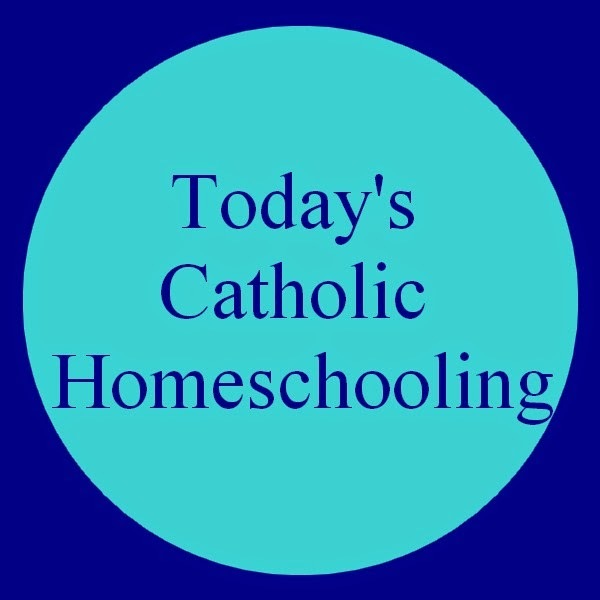 Unlike some of those idealistic portraits of homeschooling one often comes across, Rebecca Frech, a Catholic mom of seven, presents a very honest, helpful view of homeschooling, seasoned with a generous helping of humor. Topics include making the decision, getting Dad on board, talking to your family and friends about homeschooling, choosing curricula, homeschooling with different ages, facing high school, special needs, finding a support group, and how to homeschool and still take care of the house and yourself. As a veteran homeschooler myself, I found myself nodding along as I read. This is the same information I would give anyone considering homeschooling. It is a wonderful resource for anyone thinking about taking that leap into homeschooling. I took my boys on a field trip to Elms College today to visit the Forbidden Art Exhibit (http://www.elms.edu/elms-news/2015-News/Forbidden-Art-Exhibit-Tells-Personal-Stories-of-Auschwitz-Prisoners). This exhibit features large-scale photographs with accompanying descriptions of art made in the concentration camp at Auschwitz. It is truly powerful to view these pieces. The people who made them were undergoing such horrors, yet their humanity remained. They still had that impulse to create, to contribute to the world, to remember, and perhaps most importantly to hope. There were sculpture and drawings and even a small sarcophagus which held a single bone, an effort to provide a dignified burial in the midst of so much unexplainable death. The one that brought me to tears, however, was a book of fairy tales a father had made for his children back home - heartbreaking. These pieces are examples of moments of beauty in the midst of hell, a tribute to the human spirit and all who suffered in the concentration camps. For several reasons, I've held back from making a Marian consecration. (A Marian Consecration means turning one's life over to Jesus through Mary. The idea being that Mary always leads us to her Son and will always help us to God's will). Part of it is that I've always (at least in my opinion) had a good relationship with Mary. I've prayed the rosary daily since I was a little girl. She's always my go-to person for help. Another reason is that giving up another layer of control scares me. How silly of me - to think I am in control of anything in my life. God has proven that to not be the case over and over again. Yet, foolishly, I have persisted in that illusion. A last reason is that I just didn't see the point. After all, I try to do God's will in my life. I fail, but I try, and the sacrament of Confession is my great recourse in the struggle. Did I really need a Marian consecration? But, after reading The Second Greatest Story Ever Told , I've decided to take the plunge. Maybe it is because I'm now 40, and while that may be just a number, I definitely feel like I am in a different place in life. Also, I'm just worn out by life and hoping this will offer me a new sense of hope and faith. At the very least, like so many devotions of a spiritual nature, I figure it can't hurt. I'm using Fr. Gaitley's book, 33 Days to Morning Glory: A Do-It-Yourself Retreat In Preparation for Marian Consecration . He suggests picking one of several dates to begin in order to make the consecration on a Marian feast day. The next date is April 10th in order to make the consecration on May 13th, the Feast of our Lady of Fatima. It dovetails nicely with the Easter season. So, I invite you to take part with me. And even if you don't feel ready to take this step in your life, maybe you could offer a prayer for me as I take this next step in my spiritual journey. As one might expect, the first greatest story ever told is that of God creating the world and then sending His son to save us from our sins. Throughout human history, God has wanted His people to know Him, to love Him, and to Trust Him, but due to sin, this has not been an easy task. In The Second Greatest Story Ever Told, which is actually a continuation of the first greatest story, Fr. 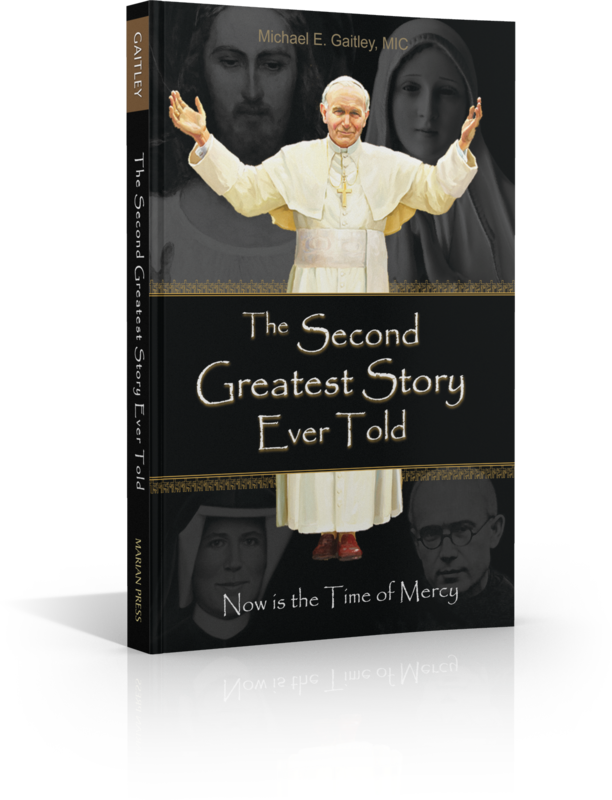 Michael Gaitley makes a compelling argument that the story of Marian Consecration, Divine Mercy, and the life and mission of St. Pope John Paul II are the second most important example of God at work in our world.